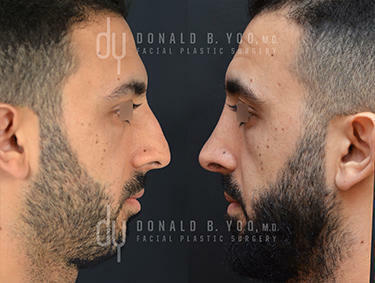 Rhinoplasty (also known as a Nose Job) is a very popular cosmetic surgery where nose surgery involving restructuring the nose is performed to improve its appearance. 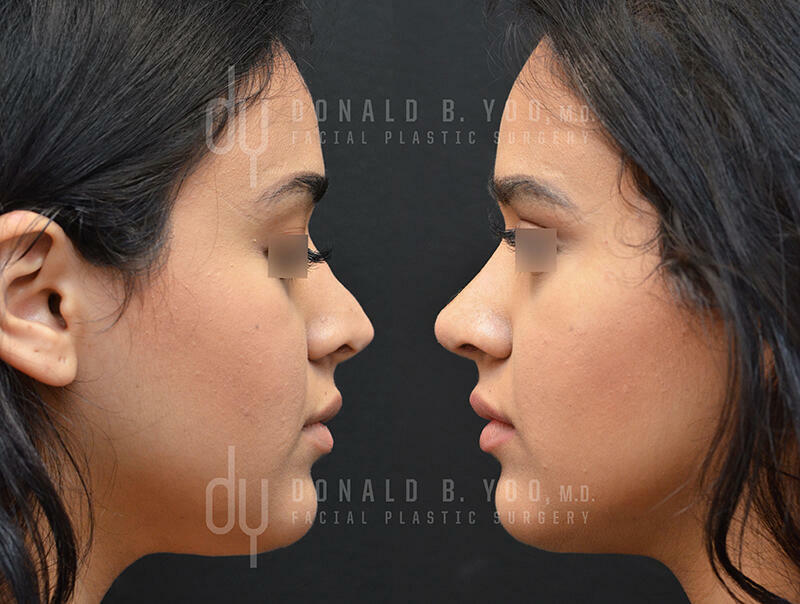 Statistically, every year 500,000+ people seek consultations with Los Angeles Plastic Surgeons and Beverly Hills Plastic Surgeons for Rhinoplasty surgery. 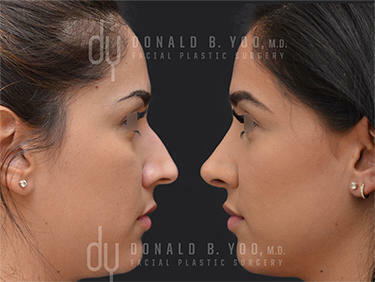 A slight alteration of the nose through Rhinoplasty can help resolve these concerns and greatly improve one’s appearance. Facial aesthetics can improve by reshaping the nose which in turn can improve self-confidence or health. 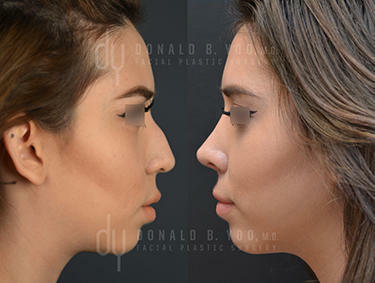 To improve the nose aesthetically (without creating a “surgical” look) and to create harmony with other facial features. 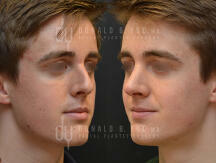 Rhinoplasty is usually performed under general anesthesia. In some cases, it may be performed using local injections of anesthesia with intravenous sedation. In both rhinoplasty and revision rhinoplasty, the majority of incisions are made inside the nose, where they are not visible on the exterior of the nose. Sometimes a small incision is made in the area of skin separating the nostrils. Cartilage and bone are then strategically removed or rearranged to produce a newly shaped nose. A septoplasty is sometimes simultaneously performed if the patient has a deviated septum (cartilage and/or bone causing obstruction inside the nose). Oftentimes to create a better balance of features, many patients will have chin augmentation surgery in conjunction with rhinoplasty. With a septoplasty, all incisions are placed entirely inside the nose. Portions of cartilage and/or bone that are causing the obstruction are then removed. 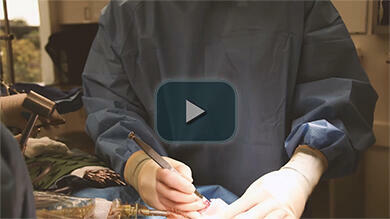 The incisions are closed with fine sutures and a splint is placed on the outside of the nose. The splint helps retain the new shape of the nose while the nose heals. 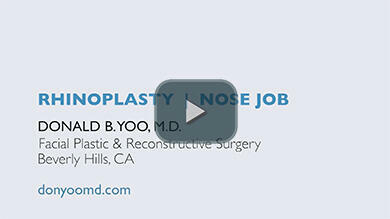 Nasal packing can be uncomfortable so Beverly Hills plastic surgeon Dr. Donald B. Yoo prefers to use thin silastic splints inside of the nose. Typically 7 days after surgery the nasal splints are removed. The majority of the bruising is resolved approximately 2 weeks after surgery. After the first 3 months the swelling is 70% resolved, and the remainder goes down over time. The final result will usually be evident 18-24 months following surgery. To help reduce bruising and discomfort, cold compresses can be used. A short course of post-operative antibiotics and steroids are given to help prevent infection and excess swelling. Although discomfort is usually minimal, pain medication is available if required. Vigorous activity is to be avoided for 4 weeks following surgery. Sun exposure and trauma must be avoided. During your consultation, Dr. Yoo will discuss factors that may influence the outcome of the surgery, such as skin type, ethnicity, age, and degree of nasal deformity. As with all facial plastic surgery, good health and realistic expectations are prerequisites. 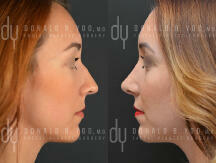 Reshape and improve the appearance of your nose. A nose which does not “fit the face” due to factors such as birth, aging, trauma or disease. Breathing issues associated with cartilage and/or bone obstruction inside the nose (deviated septum). 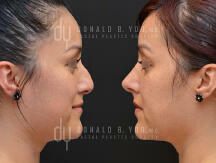 A chin implant may be needed to harmonize the nose and chin in proportion to facial features. Rhinoplasty is performed under general anesthesia or local anesthesia with sedation in our outpatient state licenced surgery center in Beverly Hills. No overnight stay is required. Most incisions are made inside the nose. In some cases, a small external excision is required. Cartilage and bone are removed or rearranged to alter the appearance of the nose. Following rhinoplasty surgery, discomfort is minimal and easily controlled by oral medication. Recuperation time is approximately 7-14 days during which time some bruising and swelling may be present. The head needs to be elevated for several days following nose surgery to minimize swelling. A nasal splint, applied to hold bone and cartilage in the new shape while the nose heals, is removed in seven days. A natural and aesthetically improved nose (without a “surgical” look) in proper proportion to your other facial features. Ideal candidates for any facial plastic surgery are those seeking improvement rather than perfection. These instructions should be carefully read and followed. They are designed to answer the most commonly asked questions regarding post-operative care for rhinoplasty, revision rhinoplasty, Asian rhinoplasty and Korean rhinoplasty. During the first week following Beverly Hills rhinoplasty surgery, limit your activity sharply. You are encouraged to walk about the house, but avoid bending at the waist or picking up heavy objects. Bleeding may result if you overexert yourself. When you rest or sleep, keep your head elevated on 2-3 pillows and try to avoid turning on your side. It is not unusual to feel a bit depressed for a few days after surgery so it helps to recognize your feelings and keep your emotions under control. This quickly passes as you begin to look and feel better. Anger or crying will only add to the swelling or initiate bleeding. Restrict your diet to easily chewable foods and drink plenty of fluids. Hard to chew foods (like steak) should be avoided for one week. To clean, use a Q-tip dipped in hydrogen peroxide and carefully clean around the nostrils 3 times a day. Immediately afterwards, place a bit of pure Vaseline or antibiotic ointment around the nostrils to keep them from drying out. For at least 2 weeks, swelling will obstruct your nasal passages. You can use a humidifier which may help you sleep by allowing you to breathe through your mouth more comfortably. Do not blow your nose or sniff excessively as this will only irritate the healing tissues. If you must sneeze, open your mouth. Also, avoid picking up babies, small children or pets; a flailing little arm may strike your nose. You probably will hit your nose one or more times during the first week. This will hurt, but will cause no problem unless the force is excessive. You may bathe in a tub with some assistance. Showering is allowed on the second post-operative day. Make sure to cover the nasal cast so that it remains dry. If the cast becomes wet, use a blow dryer to help dry it. You may carefully wash your face with a mild soap and a clean washcloth or cotton balls. Avoid cigarette smoking or even being in an area of excessive smoke as this irritates the nasal tissue and impedes healing. Also avoid alcoholic beverages the first two weeks following surgery as this may increase your chances of bleeding. It takes around 6 weeks for the nasal bones to fully heal. During this time, slowly resume your activity. After the first week, let your body tell you how much to do. Strenuous exercise may be resumed in 5-6 weeks. Build up to this level slowly. Semi-contact sports are to be avoided for 4-6 months. Swimming is allowed after 6 weeks. Do not let your nose become sunburned for 6 months after surgery. This may result in prolonged swelling and erythema (redness). When outside, make sure to wear sunscreen with a SPF of 30 or greater. Most patients feel more discomfort from nasal and sinus congestion than from pain. Any pain should be controlled with the prescribed medication. After the first day, the pain may subside enough so that plain Tylenol or Extra Strength Tylenol may be sufficient. If not, call our office and we will prescribe a stronger medication. 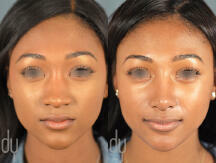 Swelling and bruising around the eyes and cheeks is variable. Swelling maximizes at about 2 days then subsides over the next week. An ice pack to the eyes during the first 48 hours may help decrease the swelling around the eyes and cheeks. This will eventually clear completely and will not adversely affect the result. Bruising (discoloration) may persist a few days longer. Remember, this will all subside in time and has no bearing on your final result. Mild bleeding is normal during the first 12 hours after surgery. It may be necessary to change the gauze a dozen or so times over this period. In the first day or two, you may experience some minor bleeding. Do not swallow the blood, as it will make you nauseated. It is also normal to have a pinkish-reddish discharge from your nose and throat for the first 3-4 days. This will gradually subside. If you have profuse nasal bleeding after this time, immediately lie down with your head elevated on 3-4 pillows. Iced washcloths placed on the back of the neck and over the eyes may help. Using nasal decongestants (such as Afrin) as directed will often help with bleeding. Please call Dr. Yoo or our Beverly Hills office if these measures do not suffice. Avoid medications such as Vitamin E, aspirin or ibuprofen for 2-3 weeks. Pain medication will be prescribed which can be taken as needed. Pain medication may impair your reactions so avoid driving or performing hazardous activities while taking this medication. If the prescribed medication does not control your symptoms, please let us know. Nausea may occasionally be related to the pain medication. Taking the medication with food may help alleviate the nausea. After the first 24 hours, Extra-Strength or regular Tylenol may be sufficient. Infection is unusual after rhinoplasty, but occasionally occurs. If you have symptoms such as a fever over 100° F or excessive pain and swelling with redness, then it may signify a developing nasal infection and should be reported. Infections generally clear up quickly with appropriate antibiotic treatment. The nasal packs will be removed on the next morning after rhinoplasty surgery. The cast and any sutures will be removed after one week. 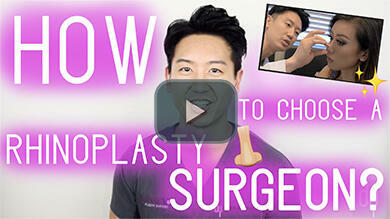 Brown paper tape will then be applied to your nose which Dr. Yoo will remove in one week. When the cast is removed, the nose will be quite swollen and the nasal tip may be slightly turned up. This will settle down over the next few weeks, then more gradually thereafter. Remember that the nose does not assume its final shape until many months after surgery, depending upon the type of nasal skin you have. It will probably look better than prior to the operation within 2-3 weeks, but the final result takes longer. Please be patient. Occasionally, an injection is necessary to reduce the swelling in one area. Any touch up surgery that may be necessary is not preformed for at least 6 months. Certain physical changes are expected following nasal surgery. Some individuals experience all of the following and others only some. The degree to which each person is affected varies and is unpredictable. You may experience changes that are also not included in this list. Bloody drainage is common in the first 48 hours after surgery. Blood-tinged nasal discharge may persist for 1-2 weeks following surgery. Profuse bleeding is unusual. Should this occur, pinch your nostrils together firmly for 10 minutes without interruptions. If this does not stop the bleeding, call our office immediately. Nasal swelling is expected and may not be readily noticeable until after the splint is removed. Most of the swelling subsides in 4-6 weeks, but subtle swelling may persist for 6-12 months. In certain situations, the doctor may inject a small amount of steroid into your nose to help reduce the swelling. Bruises following nasal surgery usually manifests as “black eyes”. Most bruising will resolve in 2-3 weeks and may be concealed with makeup if desired. Nasal breathing may be difficult for 2-3 weeks after surgery due to swelling inside the nose. This “stuffiness” will subside gradually and IS NOT improved with nasal sprays. Decongestive nasal sprays may actually cause damage to the nose and impair healing. As noted above, blood-tinged nasal discharge is common following surgery and may persist for 1-2 weeks. Itching, numbness and a “wooden feeling” to the nose are common. All of these do subside, although, it may take months for your nose to feel completely “normal”. 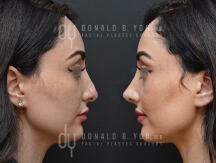 Will I benefit from Rhinoplasty?